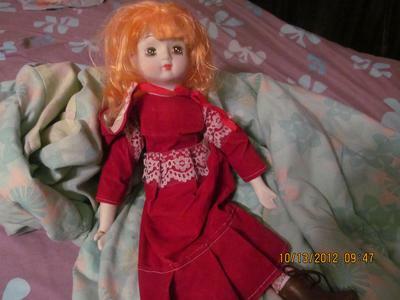 Help me identify this doll???? Well today I was browsing a thrift store and I found this little beauty. I was wondering if anyone can help me to figure as to what brand she is. All I know is that she was made in Taiwan and has a cloth body with attached limbs and head (made of bisque from what I believe) Ive checked the fragile pieces but I cannot find any brand name or detail. She has a red dress with a white lace (I believe the dress fabric is velvet?) And little leather boots. she also has a little hat that you can tie to her head. 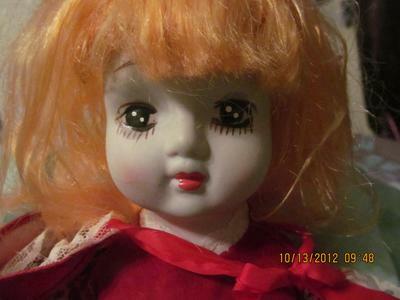 Comments for Help me identify this doll???? Just found it with my barbies and cabbage patch dolls with a label on the box collectible doll...anyone figure her out?